New Cars in our yard! 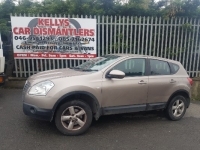 Kelly's Car Dismantlers has been in the recovery business for over 30 years. Founded by Liam Kelly Snr, and now operated by both Liam Snr and Jnr, this family run business with many years of experience in break down recovery and the dismantling of all types of vehicles. Fully compliant with all regulation, ELV & ATF registered & licenced with Kildare Co Council. Kelly's Car Dismantlers also supply and fit engines and gearboxes for many makes and models. We welcome trade and public parts enquiries.